Turmeric is one of our all-time favorite spices for decreasing inflammation. It’s tasty, boosts digestion and gently warms. Adding more salmon into your diet is anti-inflammatory and full of healthy fats. Paired with sautéed greens full of antioxidants this is a delicious meal full of health benefits. Rub salmon with turmeric, garlic powder, grated ginger, salt and pepper and half the lime juice. Place in coconut milk and bring to a boil. Poach salmon for 10 min. Add greens for last 7-8 min. Serve Salmon over greens with rice and remaining lime juice. Hello fellow detoxers, I embarked on this journey of healthy eating and bodily cleansing on Monday. I have done some detoxes in the past, which I met with great challenge and definitely had trouble sticking to all the rules. So when the idea came of doing a detox with camaraderie I jumped in. I took Dr. Eric’s advice and tried to plan well. This meant shopping and cooking on Sunday with a variety of food ready for grabbing all week long. It also meant decreasing some of my obligations in order to let my body recuperate during this time. Scheduling my bodywork was another important step, It has really helped me to have my appointments for pilates, acupuncture and chiropractic amped up for a couple weeks to support the process and help make me feel better too. The journey for me besides being squeeky clean from the inside out and identifying some food sensitives, is adapting to some life changes. Starting with the simplest of things, Water. The next is exploring more variety in my whole foods and veggies. Finally, learning how to provision the staples in my house to provide enough food available for the week, for one person, that is easy, accessible, and delicious. Yikes. So far I feel I have made great successes in these endeavors and am being rewarded with feeling great to boot. If not a bit tired at times. Some of my favorite discoveries on this detox include cooking with a pressure cooker. It is so fast, preserves the nutrients in food, the food comes out yummy, easy cleanup and saves gas, so I’m saving the environment too! I really enjoyed eating different foods at the Detox potluck, the recipes inspired me for the coming week. The chickpea salad with Mango was delicious as well as the Lentil salad. I plan on sprouting my chickpeas the next time I make hummus for extra vitamins and enzymes. I’m gearing up for the vegan days and I’m not quite sure how its going to be. I have this feeling I’m going to be facing some of the worst cravings thus far. Up until now I haven’t felt deprived at all. In fact I’ve been eating very well. Dr. Eric says the increase in Mediclear will help keep my tummy feeling full. That is comforting. Good Luck and Thank you all for the camaraderie and enthusiasm. I’m really enjoying comparing notes. That’s right folks half way there. Things have been going pretty well for me. Day 1 was a bit of a shock at work. The option of running out to grab a quick snack was out. (My favorite salmon cakes have wheat in them.) Overall though, it’s been great to reconnect with some old favorite recipes and invent some new ones. The black bean soup with sweet potatoes garnished with avocado and cilantro was delish. For a special treat I made some muffins using Bob’s Red Mill gluten free baking mix. I added kalamata olives and green olives for kicks. I’ve had a few phone calls and texts from fellow detoxers with near misses and slight slips. The dreaded wine after work craving. ( I recommend some grape Kombucha in a wine glass. It takes some getting use to but then it’s downright addictive.) One friend ate Indian and ordered the whole meal vegan until dessert when she forgot that mango ice cream was, well ice cream. Oh well one small slip does not a detox ruin. Then there were the various detoxing side effects folks experienced. Headaches seem to be the most common. Runny nose happened for a couple people. I seemed like these were definitely improved by acupuncture, visits to the spa and drinking more water. I always think it’s good when those things happen. You know you’ll be so much better off then you were before when they are over. I am a recent addition to the Glow team in the Laurelhurst location. I started my program this morning with most folks but I can’t say that, at lunch, I am feeling as… enthusiastic about doing this. Some of you may know that I am originally from Colombia and others may have seen me with constant source of caffeine dripping into my blood stream; what I like to call my “culturally inherited IV” : coffee! Giving up coffee may be the hardest part for some of you out there so I take pleasure in the thought that I am not alone (insert awful evil smile). HANG IN THERE FOLKS! WE CAN DO IT! I am enjoying teas and just warm water to help the psychological aspect of my addiction. Hope all you are doing the same! 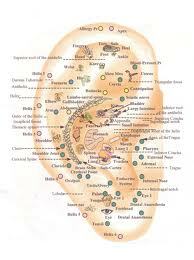 Ear acupuncture is often used for detoxification, addiction and anxiety. It provides a deeply relaxed and energized feeling and can help reset the body. According to the National Acupuncture Detoxification Association (NADA) Dr H.L Wen, a neurosurgeon in Hong Kong, was the first to report successful treatment of addiction withdrawal symptoms with acupuncture in 1973. He observed that opiate users who had undergone surgery and received acupuncture for post operative pain relief experienced few withdrawal symptoms. The National Acupuncture Detoxification Alliance has done extensive research on auricular therapy and detoxification from drug use. They have formulated a five needle protocol that has become a mainstay in detox centers around the world. A study done at Yale University notes that auricular acupuncture promotes the body to detoxify rapidly without side effects and has the added benefit of lowering anxiety levels. The following ear chart shows some of the most commonly needled points. It has been demonstrated that acupuncture stimulates the production of endorphins. Over the course of several treatments natural opiates are produced as well. Both of these chemicals are “feel good” chemicals in the body making them an effective treatment for addiction. Metabolism is stimulated to shorten the duration of symptoms associated with toxins. Function of the liver and kidneys is improved, and circulation is increased. Acupuncture eases the discomfort of any symptoms associated with detoxification as well as increases the speed an effectiveness of the overall detox. Ready for your detox? Plan your acupuncture sessions now to prevent any initial unwanted side effects including the following. Acupuncture helps curb these unpleasant side effects, shortening their intensity and duration. It also decreases cravings and prevents relapses to addictive substances like refined sugar, caffeine, alcohol, drugs, and nicotine. Chinese medicine not only clears the excess pollutants, but strengthens the underlying body systems. It improves general health, builds the immune system and increases energy. We will be using a simple but effective five needle protocol done on the ears. I have my weekend menu planned and will do some shopping this evening. Preheat oven to 400 degrees. Cut the carrots, onion, and parsnips up into approximately one-inch cubes/slices. Toss them in a bowl with the olive oil, salt, and pepper. Transfer to a sheet pan in 1 layer and roast in the oven for 20 minutes, until browned and tender. Toss the vegetables with minced dill or parsley, season to taste, and serve. Remove roasted vegetables, turn oven up to 500. Lightly rub some herbs on the lamb chops and season with salt and pepper. In a large skillet over high heat add the olive oil and sear the lamb chops on one side. Turn it over and roast it in the oven at 500 degrees for a few minutes until medium rare. Remove to warm plates. Sunday Breakfast: Mediclear smoothie AND Rice and Shine cereal cooked with walnuts and frozen berries. Dinner: Black bean soup AND Brown rice AND Salad (mixed greens, cucumbers, carrots, onion) with balsamic vinagrette. I’m off to do some shopping now and will get some almonds into some salt water to soak overnight so I can heat them tomorrow morning for a snack throughout the day. Hi! I’m Lindsey, and I’m an acupuncturist and Chinese herbalist here at Glow. I’ll be starting my detox on Monday, after a weekend in Cameno Island! In the welcome post Dr. Eric gave you some ideas of delicious and easy foods to eat on the cleanse. I thought I’d share a few of my own tricks. Generally, I try to do a cleanse once year. Usually it’s during the springtime when I have really bad tree pollen allergies. This year I was able to treat my severe runny nose, itchy eyes and sneezing using only Chinese Herbs. That was great but I found that I really missed the other effects of the cleanse like improved energy, great digestion, and overall feeling good. Normally, I eat well and take herbs and supplements as needed, but it’s always nice to have reset button for your body and life. I think one of the things that scares people the most about detoxing (besides the name) is wondering what to eat. I agree with Eric that with some planning this doesn’t have to be hard. Here’s a few thoughts. One is to plan on having at least one Mediclear shake per day (for breakfast). It also makes a great afternoon pick me up snack.Two is the ideal but for those of you who want to have one during the day and don’t have a blender, mediclear with juice is a easy (if gritty) alternative. For a quick and easy weeknight dinner buy a organic roasted chicken and add some steamed broccoli. I like to bake several sweet potatoes ahead of time and either take them for lunch with some salt, pepper and a little olive oil or add them to the next night’s dinner. You’ll be surprised how much veggies and rice you can eat so don’t scrimp on portions of those. Homemade Mexican food is both delicious and detox worthy. Trader Joes makes a pre packaged guacomole called “Avocado’s number” that is a winner. Mango salsa or peach salsa (peaches are great right now), make great additions to beans and rice. Don’t discount the grilled fish and veggies on the grill either! These ingredients can be combined in a multitude of delicious salads. Shredded cabbage with sesame oil sesame seed and salt is yummy. Also try shredded carrot with olive oil, lemon and salt.